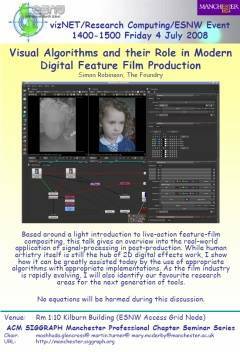 [AG-TECH] SIGGRAPH Chapter Seminar over AG: 4th July 2pm "Visual Algorithms and their Role in Modern Digital Feature Film Production"
Based around a light introduction to live-action feature-film compositing, this talk gives an overview into the real-world application of signal-processing in post-production. While human artistry itself is still the hub of 2D digital effects work, I show how it can be greatly assisted today by the use of appropriate algorithms with appropriate implementations. As the film industry is rapidly evolving, I will also identify our favourite research areas for the next generation of tools. No equations will be harmed during this discussion. Anyone wishing to view a seminar via Access Grid should note the following. Please check the Jabber room shortly before the start of the seminar to find if ScreenStreamer is to be used. Access Grid Support Centre Virtual Venue: " University of Manchester Room1:10"
http://www.memetic-vre.net/software/ScreenStreamer/ScreenStreamer.php and select room "University of Manchester (1.10)" from the AGSC section. Grab the screen feed (by clicking on it) from the screenstreamer window and resize it - more info can be found on http://www.memetic-vre.net/software/ScreenStreamer. * Alternatively, the screenshot (not animated) can be accessed at http://192.150.184.66:7890 (this IP might change for some sessions - please check Jabber). technical assistance regarding the Access Grid, please contact the Access Grid Support Centre. Non-UK Access Grid nodes are advised to contact the Access Grid Support Centre to check connectivity before the date of the seminar. possible, please let us know in advance if your site intends to join a seminar.